MotherPie: Dollars: The New Pennies? Have you seen them yet? 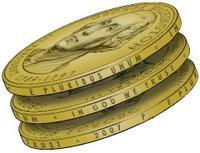 The new dollar coins? 2008 is the second production/distribution year but as of now, only the first four presidents are out. I have yet to come across one in regular circulation. Santa put these in our stockings this year as novelty items. Let's dump the pennies! The best use of pennies was the creative collection (a huge penny dump) called the Penny Harvest at Rockefeller Center in NYC (via The Boomer Chronicles). Every city should do this. With the cost of the mite dollar, you can pay $75 in Paris for a pizza and cokes. Somehow these large gold-colored coins are oddly interesting in these economic times. Monetary incongruence. I love the penny harvest idea! I always stop and pick one up when I see one. They can still add up to something good. This has got to be a scam of the U.S. Mint to raise money for the gummint, right? You never see any of these in circulation; people simply hoard them. Clever gag, I must say.